Choosing a pest control company to help keep your home and family safe is an important decision. Choose unwisely and you may end up seeing no improvement to your pest situation at all, or even worse, an unskilled pest manager might even create a whole new problem. So when deciding on a pest control company, there are a few questions that you can ask to ensure you find a reputable company. 1 .What kind of experience do you have? Experience not only refers to how many years the pest manager has in pest control, but also how much experience the pest manager has with the particular pest. It is also important to know how much experience the technician that comes to your home actually has (not the experience of the business owner). It is important to know whether the pest control company and the technician that comes to your home is licensed to carry out the inspection / treatment (general pest control and termite / timber pests are separate listings on a license) and they are insured to carry out this work. You should ask for confirmation of both / view the license / insurance before they start work. 3. What accreditations / organisations do you belong to? Most reputable pest control agencies belong to a local or national organisation of some sort. One organisation that many excellent pest control companies belong to is the Australian Environmental Pest Managers Association. PestCert accreditation also demonstrates the company is committment to a high level of training and service to provide customers with superior results. Some pests have Codes of Practice (eg. Bed bugs and Termite Management) which reputable companies will follow. 4. How dangerous is this going to be to my children/pets? All products used by Pink Pest Services are safe to use around your home and garden. However, we will inform you (before treatment), if any special actions are required (eg. keeping pets out of treated areas until dry). A good pest control company will discuss the proposed treatment with your before application and take on any concerns you may have. Ask if they have serviced anyone that you might have heard of, and if they have any customer testimonials they can share with you. Also, check their Facebook reviews, if they have a business page. If you can find people who are satisfied with their service, there is a good chance that you will be as well. Remember, if you suspect that a pest control company is not everything that it says it is, check with the Australian Competition and Consumer Commission (ACCC). They will tell you if there have been many complaints against this company or if there have been any problems in the past. 6. Can I have it in writing? By law a pest control company has to provide a treatment notice after application. For termite inspections there are very strict requirements for companies following the required standards and you should receive a comprehensive multi-page report. 7. Can I think about it? Remember that if you have a pest problem, such as termites, a delay of a few days, or perhaps even weeks, may not make a huge amount of difference to the damage that’s occurred. If you speak to a pest control company and they try to pressure you into committing to treatment right away, they might not be acting with the best of intentions. 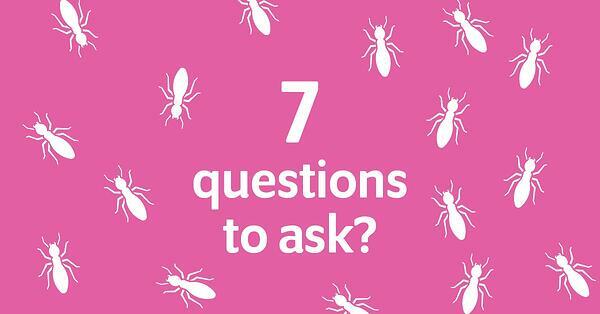 A good pest control company will give you good answers to all seven questions above. If you’re concerned about any common pests and need some help exterminating them, you can contact Pink Pest Services for assistance with professional pest control in Sydney or call or call 1300 132 062 for immediate assistance.